Foodsaver Stores makes eating a healthy breakfast easy. For about two years now, I have started regularly exercising. It was very painful at the start, I never felt like I had the strength to finish whatever exercise was at hand. But I would say after about 3 months I start visibly seeing changes, and physically feeling them. I have dropped about 17 pounds, but more importantly, I feel like I have more strength and more endurance. 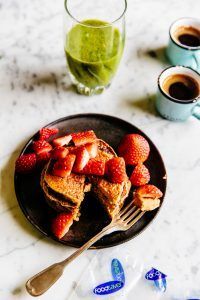 One change I made over the last two years was eating a good breakfast – I never used to do this before. But I feel it sustains me longer, and then I have a light dinner, which I prefer. I eat a variety of things for breakfast, and sometimes this includes pancakes. 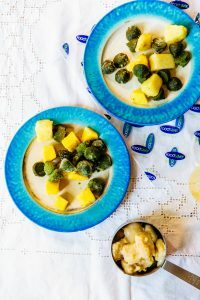 While I am not a vegan, I do enjoy eating good food, and when I am not in the mood for dairy this recipe is really good because the flavours are so good together: orange, banana, walnut. I enjoy the oats in there too. I love smoothies too, but often I find they can be a unexpectedly time consuming to prepare. So the variety of healthy smoothies from Foodsaver Stores are great, because you just add the frozen smoothie mix with juice or liquid of your choice to a blender, and my smoothie is DONE. It’s SO EASY to prepare. Also, the frozen banana from Foodsaver Stores makes making the actual pancakes easy, and having frozen banana in my freezer is considered a must for me since I use it for banana bread, and smoothies all the time. 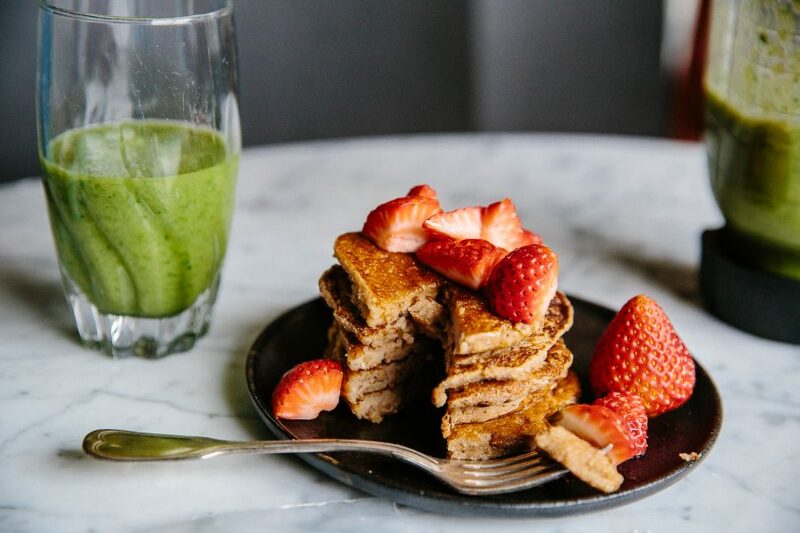 I hope you will give this recipe a go – vegan or not vegan – these pancakes are tasty! 1, Stir together the coconut milk and apple cider vinegar. Let sit for 5 minutes. 2. In a food processor add the milk and vinegar mixture, and all other ingredients except for the walnuts. Blend together until a smooth batter has formed. You may need to add more milk to get a pourable batter. 3. In a non-stick frying pan over medium heat, spoon about a 1/4 cup of batter into the pan. Cook each pancake side for at least 5 minutes. 4. Serve immediately garnished with fresh fruit and maple or carob syrup. Serve alongside Ardo Green Smoothie for a great start to the day!